Learn something new every day – These aren't gray hairs, these are highlights! When we were children, one of my siblings or I would often share at the dinner table something we had learned at school or in our reading. I can still hear, down to the enthusiastic tone of his voice, my dad saying, ‘well, is that right? You learn something new every day!’ Over the years, that has morphed into a precept for me. I don’t consciously set out to learn something new every day, but I like it when I do. It’s not usually something earth-shattering – it could be as simple as the term for when horses lie down with their legs curled under them (sternal recumbency) or how to use the timer on a microwave. What brings this to mind is a visit earlier this week to Santa Maria del Fiore, otherwise known as the Duomo. If you’ve seen my photos from previous visits to Florence, you may know that I am obsessed with this church, specifically with the dome, an obsession which has its roots in reading Ross King’s “Brunelleschi’s Dome.” However, I’ve always thought the interior was rather bare and not that interesting. During my visit, which started out as a cursory paying of my respects, I decided to rent an audio guide. Well! It was so interesting. 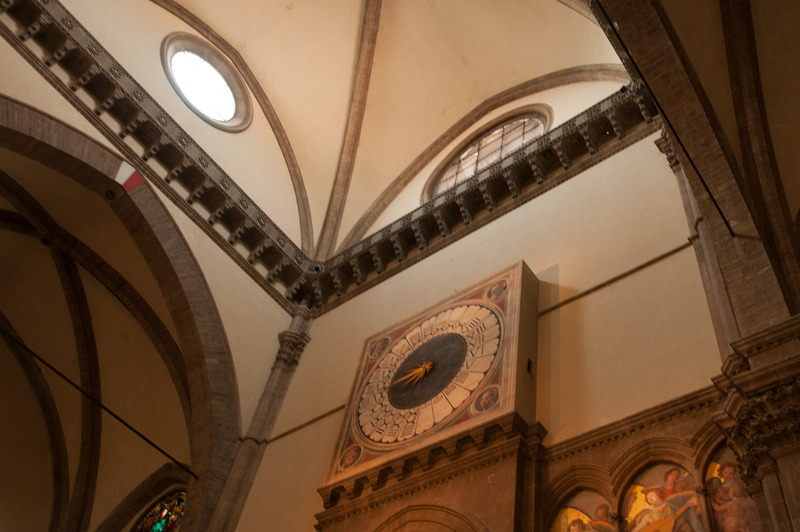 For example, this clock, painted by Paulo Uccello, is a twenty-four hour clock with a single hand that moves counter-clockwise by current standards. It marks time from sunset of the day before, so that the 24th hour is sunset of the current day, and has to be adjusted to sync with solar time. The clock still works. 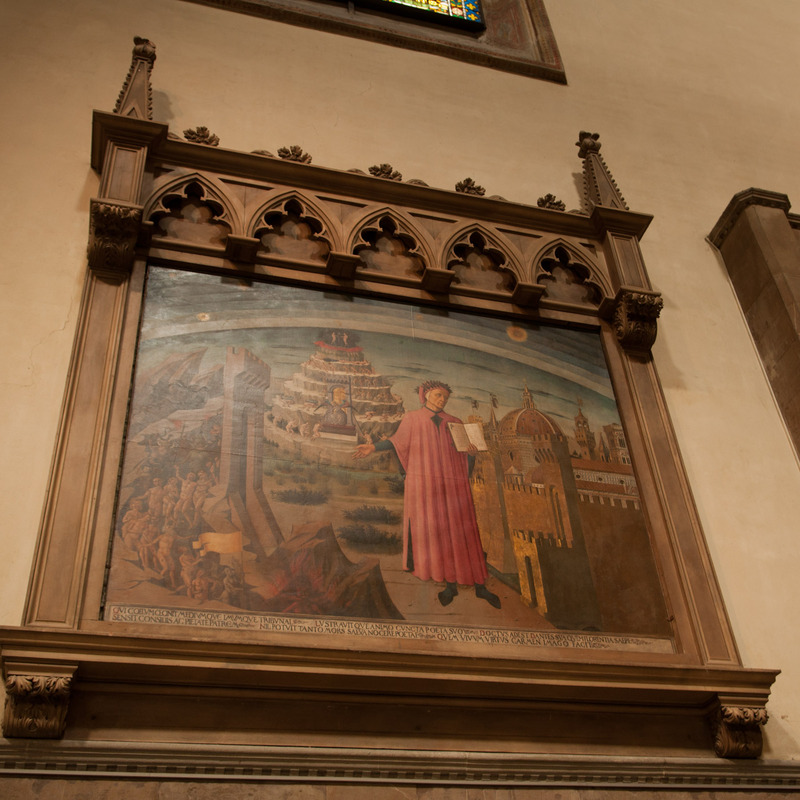 about the paintings, such as this one of Dante, holding a copy of The Divine Comedy, with depictions of Purgatory, Hell, and Heaven, and in the background, Florence, the city that exiled him. 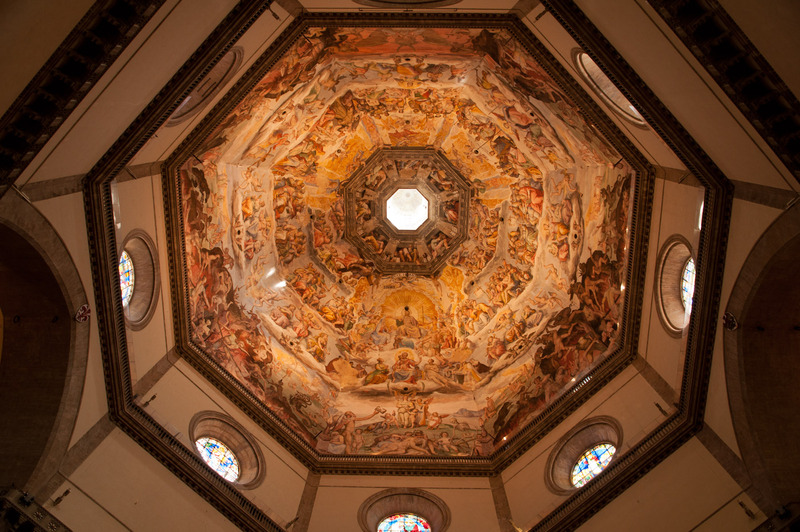 that the choir, situated under the dome, is octagonal, echoing the shape of the dome, and that the octagon is a symbol of the Resurrection. about some of the symbolism of the Last Judgment frescoes, including that the figure of Father Time handing over the hourglass represents the ending of man’s time. I also heard a few words with definitions new to me: drum (“a round wall or structure that supports a dome”), pilaster (“a rectangular column that is attached to a wall and that is used for decoration or support”), and tondo (“a sculptured medallion”). I learned a lot listening to the audio tour and it gave me a new appreciation for the interior of the Duomo. Perhaps as importantly, I re-learned to not assume that I know everything about a subject just because I know some things!